Professor Debroah Theodoros is Director, RECOVER Injury Research Centre, Faculty of Health and Behavioural Sciences, UQ. She is an academic speech pathologist with over 40 years of clinical and research experience. She served as Head of Speech Pathology at UQ from 2004-2014. 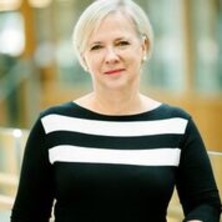 She is a founder and co-director of the multidisciplinary Centre for Research in Telerehabilitation (CRT) within the School of Health and Rehabilitation Sciences at UQ. She has an established program of research across two distinct but intersecting areas: (1) the management of motor speech and voice disorders, involving the use of intensive treatment protocols; and (2) the development and validation of telerehabilitation applications in speech pathology. She has been awarded seven NHMRC Project grants in telerehabilitation, and is CIB in a NHMRC Centre of Research Excellence (CRE) in Telehealth. She leads the Home Care theme of the CRE. The impact of her research in this area has been evident in commercialisation, policy, and more recently in the establishment of a Telerehabilitation Clinic at UQ. Currently she leads a program of research in telerehabilitation in the RECOVER Injury Research Centre. Professor Theodoros has received a career total of $11 million in competitive grant funding ($6.7 million in last five years). She has been awarded eight NHMRC Project grants, three of these as CIA. She received the first NHMRC Project Grant (301029) in telerehabilitation, and has since been awarded another 6 grants (401604, 455922, 631514, 1002472, 104809, 1129347) in this area. The impact of Professor Theodoros' research is evident in the development of telerehabilitation technology, policy work, student clinical education and clinical services. Professor Theodoros has contributed to the development of a multi-media videoconferencing system, eHAB® for rehabilitation consultations within the home, specifically speech pathology services. eHAB® has been commercialised through a start-up company, NeoRehab, and supported by four Federal and State government commercialisation awards. eHAB® is being used by several government and non-government organisations. Her research has impacted significantly on telehealth policy by providing the evidence for telerehabilitation in speech pathology. Such evidence has underpinned several telepractice position papers (Speech Pathology Australia, American Speech and Hearing Association, American Telemedicine Association). In 2014, Professor Theodoros was successful in acquiring a $500,000 philanthropic donation to establish a Telerehabilitation Clinic which is the first of its kind in Australia and will provide student clinical education in this service delivery mode and community telerehabilitation services. Are patient expectations and treatment credibility related to outcomes from LSVT LOUD? Intensive versus traditional voice therapy for vocal nodules: perceptual, physiological, acoustic and aerodynamic changes. An investigation of the Standardised Patient Interview Rating Scale (SPIRS) for the assessment of speech pathology students in a simulation clinic. Electropalatographic assessment of articulatory dysfunction in multiple sclerosis: A case study. Q2: A procedure for profiling impaired speech motor control of the tongue using electropalatography. Hyperkinetic dysarthia: Speech characteristics associated with Huntington's disease. The impact of androgenic hormones on larygeal function in women. Brain Impairment & Rehabilitation: A National Perspective. Proceedings of the 21st Annual Brain Impairment Conference (1999) . Edited by Murdoch, B. E., Theodoros, D. G. and Ward, E. C.. 21st Annual Brain Impairment Conference, 1997, Brisbane. Home-based speech treatment for Parkinson's disease via telerehabilitation: clinical and economic outcomes. Dynamic Assessment of Tongue Movements in Dysarthria Associated with Parkinson's Disease.